Clean, geometric lines and durable technology. NEW In an over-complicated world, sometimes it’s nice to keep things simple. And this is the approach we took when designing Eurosmart Cosmopolitan, focusing only on the essentials and giving them a fresh contemporary twist. The Eurosmart Cosmopolitan kitchen faucet combines the clean, geometric lines of modern architecture with durable technology. 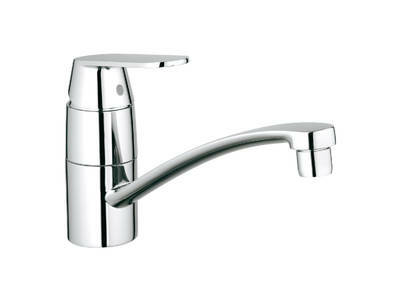 The swivel spout is convenient and easy to use – the ideal complement to any sink. Proven technologies such as GROHE SilkMove® for precise and smooth control and the high-gloss GROHE StarLight® chrome finish ensure the functionality and a flawless appearance, even after many years of use. The GROHE WaterCare version of the Eurosmart Cosmopolitan kitchen faucet effortlessly saves water and energy. And all with an unbeatable price/performance ratio.